With the stunning and talented Michelle Ryan (Lady Christina de Souza) co-starring with David Tennant (The Doctor), Planet of the Dead almost looks like a feature as we are taken on another strange and wonderful journey of this mythos. The story begins with the beautiful Lady Christina de Souza stealing an artifact from a British Museum and unfortunately things don't go according to plan and in order to escape, she finds herself on a double Decker bus, sitting next to, none other than the Doctor. Of course both world's collide and everyone, including the bus are somehow sucked through a wormhole and end up on a desert in another world. Through some initial investigation, they find themselves on a "dead" planet and of course, they are not alone or are they? To compound the situation, the wormhole that brought them to this planet also threatens the Earth and it's up to the Doctor and his motley crew of civilians and Lady Christina de Souza to find a way out of their predicament. Although the story is not as "fun" as previous Doctor Who stories, the Planet Of The Dead does have some interesting moments, especially the relationship between the Doctor and the charismatic Lady Christina de Souza who would make the perfect companion for our pragmatic hero. Once again there are some great one-liners by the Doctor, however the star of this current tale was definitely Michelle Ryan who really got into her character and without spoiling anything, hopefully we'll see her again. On Blu-ray, the video quality is quite decent with sharp images, vibrant colours and deep blacks which is quite good for a made for TV series. The audio compliments the video nicely and there are a few "wow" moments, provided you have a surround sound setup. As a special feature, there is a making of documentary regarding the Planet Of The Dead which gives the viewer a nice behind the scenes experience. 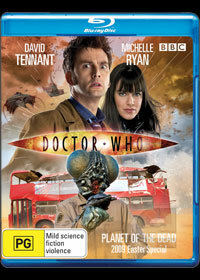 Although there has been a few mixed reviews regarding Doctor Who: Planet Of The Dead, however I found the episode quite enjoyable and Michelle Ryan proved a breath of fresh air into the series and worked quite well with David Tennant. On Blu-ray the video quality was quite exceptional, especially when they are exploring the desert which looks fantastic on our high definition TV. Another decent release from the BBC and Roadshow.